Airport receptionist: Ticket and passport, please. 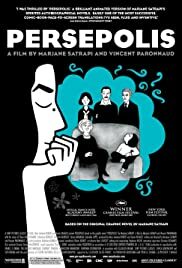 Q: Is "Persepolis" based on a book? Q: Why do the French-speakers sometimes say "Si" instead of "Oui"? 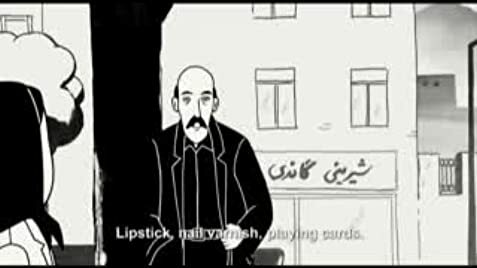 The black-and-white animation, highly stylized and two dimensions which doesn't attempt to render the usual cartoon 3-D, summarizes in quick, intelligent flashes, often impressionistic, growing up in Teheran and Vienna from a highly personal point of view. The narrative is as original as the art. The narrator, Marjane Satrapi, only daughter of an educated Teheran couple, first sketches in briefly how the Shah first came to power,only to lose it and have it replaced by the fanatical religious regime of today. Educated in a French school, she and her family are rapidly alienated from the so-called revolution; she is sent to Vienna to continue her education, falls in with a group of punks and eventually returns both depressed and disillusioned to Teheran where, with other university students, she must submit to the rule of extreme Islamists. The story covers a great deal of ground from the point of view of a young pro-Western culture radical, and is told with humor and intelligence. She laughs at herself as much as at the semi-lunatic Guards of the Revolution. Satrapi's hold on reality is much strengthened under the influence of her highly honest grandmother who teaches her not co compromise, not to betray and not to give in. This is no fairy tale with flying horses and beautiful princesses, but a serious, unsentimental and sometimes brutally honest film covering, among other events, the story of the millions of Iranians and Iraqis who died in a now forgotten seven year war around the Persian Gulf. 179 of 201 people found this review helpful. Was this review helpful to you?